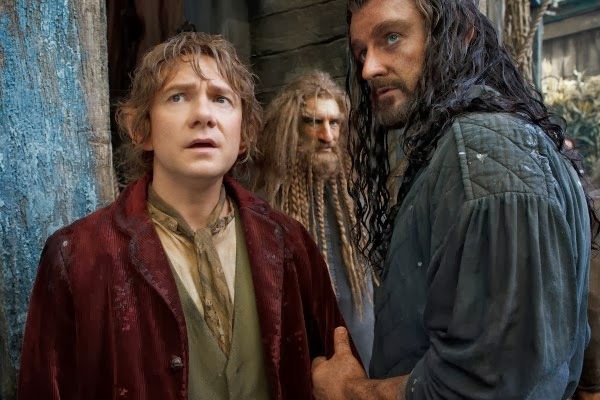 Bilbo and Thoren a bit concerned: pictures courtesy of New Line Cinemas. In J.R.R. Tolkien’s own words, The Hobbit films are starting to “feel thin, sort of stretched, like butter scraped over too much bread.” The latest installment, The Desolation of Smaug, has a sense of the franchise eeking itself out to feed the fan frenzy that ate up the epic majesty of the original Lord of the Rings films. The problem is obvious – LOTR is an actual trilogy, while The Hobbit is not. And it is becoming painfully clear that Peter Jackson is pulling every elfin rabbit out of his hat to make this light-hearted prequel into a similar sweeping epic. While this installment has enjoyable moments,there are sequences that seem long and stilted, most particularly the final battle with the dragon, Smaug. While Benedict Cumberbatch is effectively menacing as the voice of Smaug, the scene overall takes an eternity. Apparently basic laws of physics do not apply to dwarfs, as evidenced by dwarf King Thorin taking a ride down a river of molten hot metal on an iron shield, and surviving without even a burn mark on his hands. In the same category of bad logic, the dwarves surmise the dragon’s firey breath would be hot enough to stoke the furnaces of the old smithy and melt the iron in the vats, so if they just piss off Smaug enough, he’ll light the fires for them. Then they can pour the molten metal on top of him.The dwarves and Bilbo proceed to hide behind iron pillars while the fiery blast goes right past them. Nary a singed beard amongst them – forget the fact they’ve just established that Smaug’s breath is hot enough to MELT the very pillars they are hiding behind. Then there's the trip down the river in barrels while being chased by orcs, which is worthy of its own ride at Universal Studios. Fun, but again - far too lengthy. 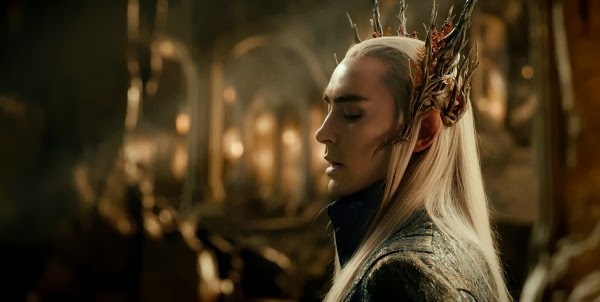 Legolas' pop Theranduil looking appropriately bishounen. All is not lost, however. Ian McKellen, whom we see far too briefly, does his usual incredible turn as Gandalf the Grey, and Martin Freeman is perfectly cast as Bilbo, who is the bravest and the most logical of all the characters that he surrounds himself with. The first glimpse of Sauron is impressive, as his silhouette forms from the iris of the great, pulsating eye, and Orlando Bloom gives a welcome return as Legolas, although his bright blue eyes look too fake to be effective. One added character not from the book is an elven warrioress, Tauriel, played by the evocatively named Evangeline Lilly, who forms a charming bond with Kili, one of the Thoren’s dwarf company. Her storyline was one of the more brilliant departures from Tolkien’s original storyline, setting up a foreshadowing of an alliance between elves and dwarfs that will come to solidify itself in the relationship between Gimli and Legolas in The Fellowship of the Ring.I was also delighted to see a cameo by the talented British actor Stephen Fry as the pompous and overstuffed Master of Laketown, who with great panache poo-poos the naysayers in regards to the danger of Smaug and embraces Thorin’s plan to reclaim the dwarve’s long-lost riches with barely restrained moustache-twirling opportunism. But all the brilliant performances and casting a great film does not make, and while I try to view each film I see with a fresh eye, The Desolation of Smaug falls far short of even its predecessor, and even its more poignant moments lose their sheen when held up against the original Academy Award-winning trilogy. Toby sez: A fun ride, but too long by half. Parting shot: Dwarves in barrels!